Taito Corporation has announced the worldwide release of Dariusburst: Second Prologue for iOS devices. Available for download from the App Store, the science fiction shooter combines elements from both its console and arcade game predecessors. Here’s some info on the game as given by the devs. Dariusburst Second Prologue is the latest installment in a series that began with the release of the original DARIUS arcade game in 1986. (DARIUS was sold in some territories under the title SAGAIA.) Chronicling the struggle to save the planet Darius from the invading Belser Army, the series’ aquatic-themed boss enemies and branching stage design quickly gathered a devoted following. 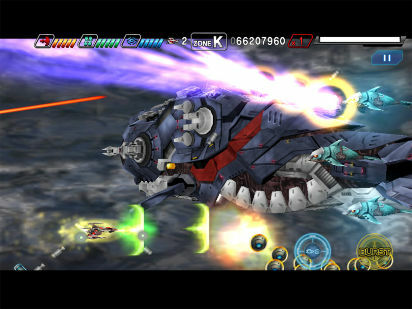 The franchise experienced a long-awaited revival in 2009, with the release of DARIUSBURST for the PSP (PlayStation Portable) system. The latest game, DARIUSBURST SECOND PROLOGUE, incorporates elements from both DARIUSBURST and its arcade follow-up DARIUSBURST ANOTHER CHRONICLE, delivering the definitive portable DARIUS experience.